in a little over one hour of combat. history organizations, work today to preserve the memories of our ancestors and their deeds, both Union and Confederate, for this and future generations. The Missouri State Guard Flag was never formally adopted as the official state flag in Missouri legislation. The flag was adopted in Missouri by direction of General Sterling Price of the Missouri State Guard. When orders were issued in the Spring of 1861 for district commanders of the State Guard to prepare their troops for active duty, they were instructed that each regiment: "was to carry a Missouri flag, made of blue merino, with the state arms in gold on both sides"
4th Missouri Infantry Regiment Flag is a Van Dorn pattern battle flag. 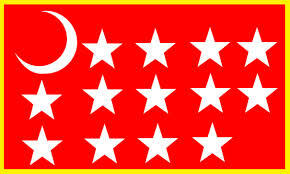 It had a red field adorned with thirteen white stars arranged in five rows, with a white crescent in the upper corner. It also has a yellow border. 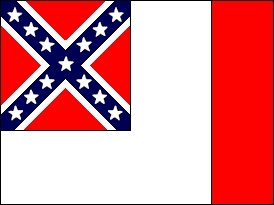 A number of Trans-Mississippi commands used this flag. 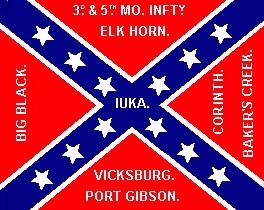 When General Van Dorn brought his regiments to the east of the side of the river in 1862 to join Beauregard's army at Corinth, Mississippi, they brought these flags with them and fought under them at the battle of Corinth in October of that year. The 4th Infantry Regiment completed its organization in April, 1862 with men from Springfield and the surrounding area. Most all of its members served in the Missouri State Guard. The Missouri Battle Flag was distinctly associated with the Trans-Mississippi Department. It was carried almost exclusively by Missouri regiments, becoming identified as the "Missouri Battle Flag". It is a blue flag bordered with red, and a white Roman cross in the field near the hoist of the flag. The First National Flag also know as the "Stars and Bars" was adopted March 4, 1861, by the Confederate Congress. Like some of the early state flags, the 1rst. National looked similar to the "Stars and Stripes". It was designed by Nicola Marschall of Alabama. The flag had three equal horizontal bars: red, white, and red. When it was first adopted, the blue canton consisted of seven starts in a circle, symbolizing the first seven states of the Confederacy: South Carolina, Mississippi, Alabama, Louisiana, Georgia, Florida, and Texas. The Confederate Battle Flag was adopted in 1861 to avoid confusion on the battlefield with the 1rst National because they looked so much alike. General P.G.T Beauregard proposed that the design of William Porcher Miles as the Confederate battle flag. 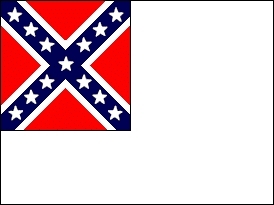 Miles designed a rectangular red field crossed with a blue saltire, also known as the Saint Andrew's Cross, holding 7 white stars, symbolizing the 7 states of the Confederacy at the time. The Second National Flag was adopted in May of 1863, because the 1rst National looked too similar to the Stars and Stripes and was hard to distinguish between the two amidst the smoke and confusion on the battlefield. This flag was nicknamed "The Jackson Flag" beacause it was first officially used to cover the casket of Thomas J. "Stonewall" Jackson at his funeral. It is commonly know as the "Stainless Banner" beacasue of the plain wihite field. 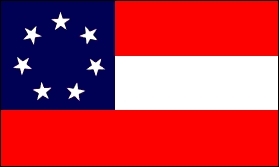 The flag's red canton was crossed by a white-edged, blue saltire, also know as the Sain Andrew's Cross, holding 13 white stars for the 13 states of the Confederacy. The Third National Flag was adopted in March of 1865 was adopted in March of 1865. The Confederate Congress changed the flag's proportions and added a red vertical bar to the fly end. Only a few of the 3rd. Nationals were made before the surrender at Appomattox. The red bar now symbolizes the blood shed by the Confederate veterans. Commanded by Col. Benjamin A. Rives, Col. William R. Gause; Col. James A. Pritchard; Lt. Col. Finley L. Hubbell, Lt. Col. James K. McDowell, and Maj. Robert J. Williams. It served in the Missouri Brigade, east of the Mississippi River in Little's Division, Bowen's Division, and French's Division. It saw action from Vicksburg, Mississippi to Atlanta, GA. Ft. Blakely inside Mobile, Alabama in the south to Franklin,Tennessee in the North. Akers Jasper N. MO 3rd Inf. Co.A Cpl. Ashley Samuel MO 3rd Inf. Co.A Sgt. Baber Benjamin F. MO 3rd Inf. Co.A Cpl. Bernard William M. MO 3rd Inf. Co.A Sgt. Broadaus Orval A. MO 3rd Inf. Co.A Music. Burgher M.D. MO 3rd Inf. Co.A 1st Lt.
Green Richard K. MO 3rd Inf. Co.A 2nd Lt.
Hendley Malnor R. MO 3rd Inf. Co.A 1st Sgt. Lamb Richard J. MO 3rd Inf. Co.A 1st Lt.
McDonald Ludwell MO 3rd Inf. Co.A Cpl. McIntyre D.H. MO 3rd Inf. Co.A Capt. Morehead A.H. MO 3rd Inf. Co.A Sr.2nd Lt.
Richardson James H. MO 3rd Inf. Co.A Sgt. Sisk Bartlett MO 3rd Inf. Co.A Cpl. Taylor Obediah MO 3rd Inf. Co.A Capt. Tole Allen MO 3rd Inf. Co.A Sgt. Webb Jesse M. MO 3rd Inf. Co.A Sgt. Williams Robert J. MO 3rd Inf. Co.A Maj.
Baldock Richard MO 3rd Inf. Co.B Music. Bentley Joseph MO 3rd Inf. Co.B Sgt. Bush John M. MO 3rd Inf. Co.B Cpl. Bush Benjamin J. MO 3rd Inf. Co.B Sgt. Ewing Abel R. MO 3rd Inf. Co.B Sgt. Fallis William R. MO 3rd Inf. Co.B Sgt. Fletcher Thomas J. MO 3rd Inf. Co.B 1st Lt. Flood Michael MO 3rd Inf. Co.B 1st Cpl. Gause William R. MO 3rd Inf. Co.B Col.
Goode Thomas T. MO 3rd Inf. Co.B Cpl. Greene Joseph E. MO 3rd Inf. Co.B Capt. Kier Thomas J. MO 3rd Inf. Co.B Capt. Leatherman William MO 3rd Inf. Co.B Cpl. Lumis Charles MO 3rd Inf. Co.B Cpl. McCrea A.J. MO 3rd Inf. Co.B Sr.2nd Lt.
Miller William H. MO 3rd Inf. Co.B Sgt. Morgan William MO 3rd Inf. Co.B 1st Sgt. Patton Thomas Jeff MO 3rd Inf. Co.B Capt. Plaster James L. MO 3rd Inf. Co.B 1st Sgt. Scammahorn D.A. MO 3rd Inf. Co.B Cpl. Setzer William L. MO 3rd Inf. Co.B 1st Lt.
Setzer Samuel H. MO 3rd Inf. Co.B Sgt. Storey J.P. MO 3rd Inf. Co.B Cpl. Taylor William MO 3rd Inf. Co.B Sgt. Warner George B. MO 3rd Inf. Co.B Sgt. Berry James H. MO 3rd Inf. Co.C Cpl. Berry James O. MO 3rd Inf. Co.C Cpl. Creel Claudius J. MO 3rd Inf. Co.C Cpl. Dobbs William P. MO 3rd Inf. Co.C Sgt. Duval William R. MO 3rd Inf. Co.C Jr.2nd Lt.
Ewing George S. MO 3rd Inf. Co.C Sgt. Gant Thomas R. MO 3rd Inf. Co.C Cpl. Graham John G. MO 3rd Inf. Co.C Sr.2nd Lt.
Himmelwright John S. MO 3rd Inf. Co.C Cpl. Holman William A. MO 3rd Inf. Co.C 1st Lt.
Hurst James D. MO 3rd Inf. Co.C Cpl. Kelso John R. MO 3rd Inf. Co.C Ch.Music. Maberry William J. MO 3rd Inf. Co.C Jr.2nd Lt.
Mansur William H. MO 3rd Inf. Co.C Sr.2nd Lt.
Mason Alexander O. MO 3rd Inf. Co.C Sgt. McCuistion Gwinn MO 3rd Inf. Co.C Capt. McCuistion Jefferson MO 3rd Inf. Co.C Sgt. McDowell James K. MO 3rd Inf. Co.C Lt.Col. Mizner William MO 3rd Inf. Co.C Ord.Sgt. Paine Delos C. MO 3rd Inf. Co.C Cpl. Sterne John H. MO 3rd Inf. Co.C 1st Lt.
Turner Lynch MO 3rd Inf. Co.C Sgt. Walker Thomas J. MO 3rd Inf. Co.C Sgt. Wall Octavius MO 3rd Inf. Co.C 1st Sgt. Bivens O.P. MO 3rd Inf. Co.D Jr.2nd Lt.
Bradshaw James W. MO 3rd Inf. Co.D 2nd Lt.
Bronaugh David MO 3rd Inf. Co.D Sgt. Burke Richard MO 3rd Inf. Co.D Cpl. Cockrill Thomas J. MO 3rd Inf. Co.D Cpl. Cook A.C. MO 3rd Inf. Co.D 2nd Lt.
Dougherty L.B. MO 3rd Inf. Co.D 1st Lt.
Dougherty John K. MO 3rd Inf. Co.D Sgt. Ford James H. MO 3rd Inf. Co.D Comsy.Sgt. George John T. MO 3rd Inf. Co.D 1st Lt.
Herriman William S. MO 3rd Inf. Co.D 3rd Lt.
Hix James P. MO 3rd Inf. Co.D Sgt. Hockensmith F.M. MO 3rd Inf. Co.D Cpl. Huntley Seth E. MO 3rd Inf. Co.D Sgt. Kelley John W. MO 3rd Inf. Co.D Cpl. Marquam James P. MO 3rd Inf. Co.D 1st Sgt. McGlauflin Thomas MO 3rd Inf. Co.D Sgt. Prather Freeman MO 3rd Inf. Co.D Sgt. Price Jesse L. MO 3rd Inf. Co.D Capt. Purnell Isaac MO 3rd Inf. Co.D 1st Sgt. Robertson A.M. MO 3rd Inf. Co.D Sr.2nd Lt.
Saunders William MO 3rd Inf. Co.D Cpl. Shouse John W. MO 3rd Inf. Co.D 3rd Lt.
Thompson David MO 3rd Inf. Co.D Capt. Thompson R.C. MO 3rd Inf. Co.D Sgt. Tillery Llewellyn MO 3rd Inf. Co.D Sgt. Titus John H. MO 3rd Inf. Co.D Sgt. Weldon Joseph MO 3rd Inf. Co.D Sgt. Withers George W. MO 3rd Inf. Co.D 2nd Lt.
Wood William L. MO 3rd Inf. Co.D Sgt. Allen John M. MO 3rd Inf. Co.E Surg. Austin Elijah MO 3rd Inf. Co.E Cpl. Barger James H. MO 3rd Inf. Co.E Sgt. Bates T.M. MO 3rd Inf. Co.E Cpl. Black M.G. MO 3rd Inf. Co.E Sgt. Blizzard J.W.C. MO 3rd Inf. Co.E Sgt. Burnside R.L. MO 3rd Inf. Co.E Sr.2nd Lt.
Calvert John A. MO 3rd Inf. Co.E Sgt. Carter John D. MO 3rd Inf. Co.E 1st Lt.
Covell George W. MO 3rd Inf. Co.E Capt. Ervin J.A. MO 3rd Inf. Co.E Sgt. Everett M.R. MO 3rd Inf. Co.E Sgt. Faulkner K.H. MO 3rd Inf. Co.E 2nd Lt.
Humphreys Charles W. MO 3rd Inf. Co.E Jr.2nd Lt.
Osborn W.T. MO 3rd Inf. Co.E 1st Lt.
Owens Crockett MO 3rd Inf. Co.E Cpl. Pyron Tom P. MO 3rd Inf. Co.E Cpl. Samuel John L. MO 3rd Inf. Co.E Sgt. Shanks A.M. MO 3rd Inf. Co.E Cpl. Simpson A.W. MO 3rd Inf. Co.E Sgt. Smith W.A. MO 3rd Inf. Co.E 1st Sgt. Smith Anderson C. MO 3rd Inf. Co.E Capt. Smith J.V. MO 3rd Inf. Co.E Sgt. Allen Philip MO 3rd Inf. Co.F Sgt. Baker Francis M. MO 3rd Inf. Co.F 2nd Lt.
Burford Edwin F. MO 3rd Inf. Co.F Sgt. Conkling Thomas J. MO 3rd Inf. Co.F 1st Sgt. Coulson William H. MO 3rd Inf. Co.F Sgt. Cravens John M. MO 3rd Inf. Co.F 2nd Lt.
Davis Ned MO 3rd Inf. Co.F Jr.2nd Lt.
Davis Edward MO 3rd Inf. Co.F Jr.2nd Lt.
Glasscock Erven M. MO 3rd Inf. Co.F Sr.2nd Lt.
Lile John B. MO 3rd Inf. Co.F Sgt. Lowry Thomas G. MO 3rd Inf. Co.F Capt. Richardson Temple MO 3rd Inf. Co.F Cpl. Rives Robert MO 3rd Inf. Co.F 1st Lt.
Smith James A. MO 3rd Inf. Co.F Sgt. Stratton Peter A. MO 3rd Inf. Co.F Cpl. Vallandingham Richard L. MO 3rd Inf. Co.F Sgt. Vaughan William M. MO 3rd Inf. Co.F Cpl. Williams Merritt MO 3rd Inf. Co.F Cpl. Williams Thomas H. MO 3rd Inf. Co.F Cpl. Williams Charles P. MO 3rd Inf. Co.F Sgt. Adams William C. MO 3rd Inf. Co.G Capt. Blakemore James M. MO 3rd Inf. Co.G 1st Sgt. Carbry James T. MO 3rd Inf. Co.G 1st Lt.
Cargill John N. MO 3rd Inf. Co.G Sgt. Cowan Andrew MO 3rd Inf. Co.G Sgt. Douglass Sydney A. MO 3rd Inf. Co.G 2nd Lt.
Drake James M. MO 3rd Inf. Co.G Cpl. Hall James MO 3rd Inf. Co.G Cpl. Hilliard J.H. MO 3rd Inf. Co.G Music. Holmes Arthur MO 3rd Inf. Co.G Sgt. Jones John P. MO 3rd Inf. Co.G Jr.2nd Lt.
Kemper John W. MO 3rd Inf. Co.G Capt. Kemper Samuel T. MO 3rd Inf. Co.G Sgt. Minter John A. MO 3rd Inf. Co.G 2nd Lt.
Mitchell Thomas J. MO 3rd Inf. Co.G Music. Patterson William MO 3rd Inf. Co.G Sgt. Potts Enoch MO 3rd Inf. Co.G Cpl. Smith James R. MO 3rd Inf. Co.G Cpl. Ashby William H. MO 3rd Inf. Co.H Jr.2nd Lt.
Bagby John W. MO 3rd Inf. Co.H Capt. Baxter George MO 3rd Inf. Co.H Sgt. Benson John S. MO 3rd Inf. Co.H Cpl. Bramel William F. MO 3rd Inf. Co.H Ch.Music. Brookshier Thomas B. MO 3rd Inf. Co.H 1st Lt.
Carroll John MO 3rd Inf. Co.H Sgt.Maj. Everman W.A. MO 3rd Inf. Co.H Cpl. Forsee Granville T. MO 3rd Inf. Co.H Hosp.Stew. Grimes James S. MO 3rd Inf. Co.H Sgt. Gustin Samuel MO 3rd Inf. Co.H Cpl. Hayden William H. MO 3rd Inf. Co.H Cpl. Holladay John W. MO 3rd Inf. Co.H Cpl. Jett Benjamin D. MO 3rd Inf. Co.H Cpl. McCue Paul M. MO 3rd Inf. Co.H Ord.Sgt. Minshall John E. MO 3rd Inf. Co.H Adj. Mirick William G. MO 3rd Inf. Co.H Capt. Mirick M.R. MO 3rd Inf. Co.H Sgt. Parker James H. MO 3rd Inf. Co.H Ord.Sgt. Settles James W. MO 3rd Inf. Co.H Sgt. Staggs John E. MO 3rd Inf. Co.H Sr.2nd Lt.
Tucker John S. MO 3rd Inf. Co.H 1st Sgt. Wallis James D. MO 3rd Inf. Co.H Asst.Surg. Ware E. Monroe MO 3rd Inf. Co.H Sgt. Anderson Samuel MO 3rd Inf. Co.I Cpl. Atchison J.B. MO 3rd Inf. Co.I Sgt. Bowman S.W. MO 3rd Inf. Co.I 1st Sgt. Chamberlin William M. MO 3rd Inf. Co.I Capt. Elston B.F. MO 3rd Inf. Co.I Cpl. Evans R.B. MO 3rd Inf. Co.I Music. Gill P.H. MO 3rd Inf. Co.I 1st Sgt. Hughes Archibald MO 3rd Inf. Co.I Cpl. Ireland Thomas S. MO 3rd Inf. Co.I Sgt. Laffoon R.J.M. MO 3rd Inf. Co.I Sgt. Major G.P. MO 3rd Inf. Co.I Music. McIlvain William P. MO 3rd Inf. Co.I Capt. Miller John MO 3rd Inf. Co.I Sgt. Minor A.T. MO 3rd Inf. Co.I Cpl. Mothershead Joseph R. MO 3rd Inf. Co.I 1st Lt.
Mothershead N.G. MO 3rd Inf. Co.I Sgt. Rogers George W. MO 3rd Inf. Co.I Chap. Rupe Harvy O. MO 3rd Inf. Co.I Jr.2nd Lt.
Summers John T. MO 3rd Inf. Co.I 2nd Lt.
Vaughn J.J. MO 3rd Inf. Co.I 1st Sgt. Vermillion B.F. MO 3rd Inf. Co.I 2nd Lt.
Vines Joseph MO 3rd Inf. Co.I Cpl. Best Franklin MO 3rd Inf. Co.K Sgt. Bradley James M. MO 3rd Inf. Co.K Cpl. Cleveland Charles B. MO 3rd Inf. Co.K 1st Lt.
Cleveland Benjamin A. MO 3rd Inf. Co.K Sgt. Haines David MO 3rd Inf. Co.K Cpl. Hallack William J. MO 3rd Inf. Co.K Sgt. Knight Lucian F. MO 3rd Inf. Co.K Cpl. Mayham John MO 3rd Inf. Co.K Sgt. Polk Willis W. MO 3rd Inf. Co.K Sgt. Quinn Malcolm G. MO 3rd Inf. Co.K 1st Sgt. Rice William W. MO 3rd Inf. Co.K Sgt. Rucker Robert MO 3rd Inf. Co.K Cpl. Rutter James MO 3rd Inf. Co.K Capt. Samuel Aurelius E. MO 3rd Inf. Co.K Capt. Samuel Edmund W. MO 3rd Inf. Co.K Cpl. Tinsley James A. MO 3rd Inf. Co.K 1st Lt.
Yates Robert A. MO 3rd Inf. Co.K Sgt. Adams W.C. MO 3rd Inf. Allen J.W. MO 3rd Inf. Surg. Avent Ferdinand MO 3rd Inf. Baker William J. MO 3rd Inf. Ballou Needham B. MO 3rd Inf. Bishop S.W. MO 3rd Inf. Sgt. Bledswood John M. MO 3rd Inf. Bounds E.M. MO 3rd Inf. Chap. Burns Joseph H. MO 3rd Inf. Chew V.T. MO 3rd Inf. Asst.Surg. Cobbs Radford M. MO 3rd Inf. Cook J. Henry MO 3rd Inf. Creason Allen MO 3rd Inf. Creason Jackson MO 3rd Inf. Crowdus J.W. MO 3rd Inf. Surg. Davidson Joseph MO 3rd Inf. Dorsey Robert J.N. MO 3rd Inf. Dudley William T. MO 3rd Inf. Gilmore S. MO 3rd Inf. Holman J.N. MO 3rd Inf. Asst.Surg. Hubbell F.L. MO 3rd Inf. Lt.Col. King Horace W. MO 3rd Inf. Surg. Klepper Joseph C. MO 3rd Inf. Lawrence John K. MO 3rd Inf. Mills C.B. MO 3rd Inf. Sgt. Osterloh Frederick MO 3rd Inf. Porter Alfred MO 3rd Inf. Pritchard James A. MO 3rd Inf. Col.
Richmond G.G. MO 3rd Inf. 2nd Lt.
Rives Benjamin A. MO 3rd Inf. Col.
Robinson J.H. MO 3rd Inf. Rodgers G.W. MO 3rd Inf. Chap. Snell Edward P. MO 3rd Inf. Wallen Elisha MO 3rd Inf.